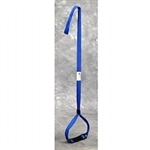 This is used to assist in dressing and lifting clothing. The White Rigid Mercer Sock-Aid with CORD HANDLE is firm for use with socks/stockings allowing patient to apply sock with ease. The L3009 Deluxe Sock Aid is a molded design that makes it easier to put on socks. 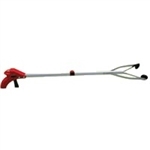 Rose Healthcare Deluxe Aluminum Reacher 26"
Rose Healthcare Deluxe Aluminum Reacher has lightweight aluminum shaft for easy handling and magnetic tip for picking up metal items. 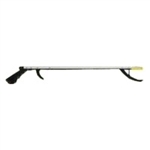 Assists with getting out of bed or wheelchair Leg Lifter 42"
Rose Healthcare Deluxe Folding Reacher 32"
Rose Healthcare Deluxe Folding Reacher is lightweight with durable aluminium construction.